POM Wonderful is a global brand committed to innovation and wellness. We grow and market pomegranates and pomegranate-based products that are healthy, honest and essential to the well-being of humankind. Have you ever sunk your teeth into a pomegranate? I haven't, But have been wanting to! I finally got my chance when the amazing people at the Pom Wonderful facebook page gave blogger's (That incluses me) the chance to try the new P♥M P♥M Wonderful Fresh Arils. I have always been amazed at the brightly colored but weird little fruit thing in the produce isle at my local walmart. But never had the courage to try it, because .. well I wasn't sure how to eat it! 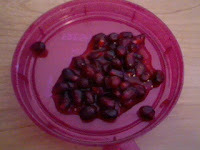 after receiving my Fresh Arils I quickly realize that you eat the brightly colored seeds (Inside) the Pomegranate! (Duh!) I was still a little iffy hesitant about trying it.. Because I'm not big on trying new things and change. So my husband, being the brave one in the marrage and loves to try new things, quickly chowed down. He looked at me with his big blue eyes and was like..Wow.. Not bad. So I decided since he liked them I would give them a try. I picked out a pretty Aril and munched on it. I was surprised that it was kind of crunchy.. But really delicious! It had a bitter sweet taste. But would be amazing in a salad to perk up the colors and give it an amazing flavor boost. 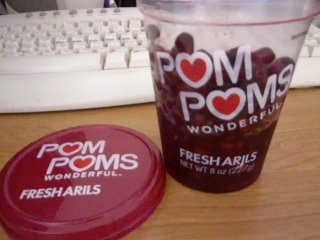 Now that I know how good the actual Arils are, I think I might actually be brave enough to give the Pomegranate drink a try Pom Wonderful Products . Have you had your Pom Wonderful today?